We are so lucky to be blessed with so much warm weather, and so many fun ways to cool off! Apart from our beautiful beaches, there are fantastic local playgrounds with water features dotted around Sydney for more FREE fun in the sun. For adventure in and out of the water this huge play area (pictured above) is an absolute must! Surrounded by the hustle and bustle of Darling Harbour, this impressive play space is a kids oasis, right in the city. The playground is a wonderland of balance ropes, giant swings, a jumbo ring, a big slide and slide hill, a flying fox, an octonet and more! After tackling that terrain the kids will need to cool down, and the ‘Water Works’ is the place to do it. It’s a masterful maze of waterways where kids control the flow, via water switches, water gates, a water wheel and an Archimedes water screw! Plus, it has pump stations, water squirts, and sand pits with diggers. This unique play space provides a diverse range of activities and challenges for kids of all ages and abilities – and it’s home to the largest outdoor water play facility in NSW. Plus there’s a double flying fox, mega-swing, tunnel slides, scramble wall, spinning play disk, Viking swing, and a multi-level tree house, all spread over 3 hectares along the Parramatta River. With it’s amazing architectural equipment and bright, cheerful colours, this spectacular waterside park is a world away from your average playground. We checked out the epic playground at Blaxland and it sure does have the WOW factor. What better way to stay active and cool off than at Cables Aqua Park...the ultimate INFLATABLE water park, with slides, runways, climbing structures and jumping pillows galore! This one isn't free, but is SO worth the $20/pp price for a 50-minute Aqua Session (or pay $30/pp for 2 x 50-minute sessions). There is also a free wet play area for kids under 6, so bring the whole family along. If you’ve got playground fatigue and need a change of scenery, this harbourside parkland is the place for you! The award-winning, multi-million dollar creation is one of the newest and most thoughtfully designed parks in Sydney. Kids immerse themselves in the play space while parents soak up the surroundings! The unique adventure playground has fun water play features like sprinklers and fountains, which are a hit on a hot summer’s day. There is also a big sandpit, climbing structures, slippery dips, swings and musical play equipment to keep little adventurers entertained. There’s plenty of room to ride a bike, kick a ball or have a picnic! Steel Park has a lovely playground with equipment to suit both the littlies and older children, surrounded by plenty of space, lots of grass , poplar trees providing great shade and a great view of the Cooks River. However, its Waterplay Park is still the main drawcard. The interesting series of water features include interactive fountains, sprinklers and misty spray elements, designed to encapsulate the total water cycle and demonstrate an environmental process in action. It’s safe, creative and lots of fun. The newish one on the scene, the Ian Potter Children's WILD PLAY Garden has one of Sydney's best water play parks. It opened up last year and already making a splash with its artesian water play area complete with water jets. There's also 10-metre long Banksia Scrub tunnels, wobbly rope bridges leading up to a climbing tower and cubby house with a super slide to bring kids back to ground level, teepees, a swamp area, dry creek beds, and lots more. So it's a good one for the whole year! Right on the waterfront, this beautiful park is an expanse of lush lawn and natural wonder. The fantastic main playground boasts a huge tube slippery dip, large climbing net, lookout tower and combination equipment. Plus, it is heaven on a hot day with its large water feature – two shaded paddling pools linked by a little stream for hours of splashing fun. For the older kids, there’s another playground near the river with a huge spider rope climbing frame suspended over a big sandpit. There is also a smaller playground at the southern end of the park with equipment suitable for young children. A short drive away from Wet’n’Wild, this water park at Nurragingy Reserve is a huge gem for Western Sydney kids. This free water park facility features a number of fountains, hoses and waterfalls to help you cool off while having fun in the picturesque Western Sydney Parklands. The bonus also comes with the huge playground alongside the water play area, with sandstone, jarrah logs, river stones, recycled timber sleepers and shipping ropes. Open every day through summer from 9am to 6.30pm. 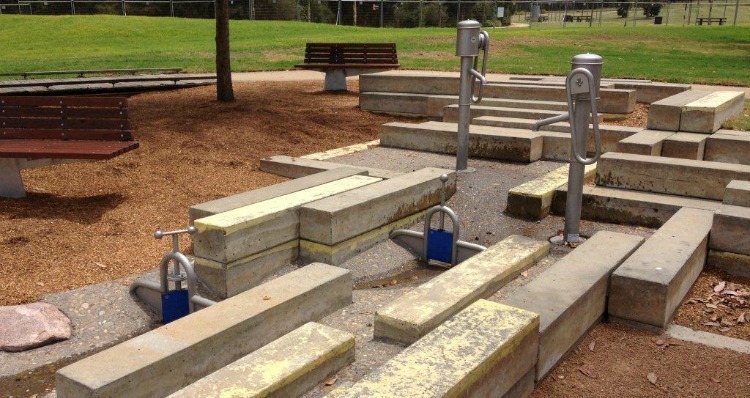 Parramatta Council opened a brand new water play park at James Ruse Reserve in September 2014. This delightfully shaded water play area is suitable for both little and big kids. The water park runs from 9am to 7.30pm during summer, 10am-4pm during spring and autumn, closed during winter. This sustainable splash park opened in April 2014 has an amazing array of fun water features which continuously collects and recycles its own water. The kids can splash about in the fountains, sprays and tipping buckets which dumps 1600 litres of water a minute! The splash park is open during summer, autumn and spring. Our favourite feature of this park is the gigantic Olympic Cauldron with cascading water which the kids will love splashing in. There is a large grassy area perfect for picnics. You also have your choice of playgrounds nearby along with a variety of cafes. There is also an outdoor chess board. In January, the whole family can enjoy free movies under the stars at Movies by the Boulevard. OK, so this colourful water paradise, is not technically in Sydney, but we thought it was just so cool that it was worth including it (and making the trip from Sydney). This features a shallow wading pool and brightly painted water fountains for the children to splash about under and climb over. It’s perfect for little ones. It has ample shaded seating for the parents to sit back and relax while the children play. This fun waterplay zone features a sheltered area with varying sized water troughs, a hand wheel water pump, a concrete water maze and spurts and sprays coming from all over – just perfect for the kids (and adults) on a warm, sunny day. Open Summer: January – May and September to December. There is also a Junior Playground for 2 – 8 year olds featuring a junior activity unit, swings, a rotating ball, play tables, balance beams, rubber mushrooms and more! The Big Kids Playground boasts a Flying Fox, balance cable and beams, climbing units, slides and more! This brand new one opened in December 2018! The playground features three play zones for all ages including a toddler zone, 36 play features including a toddler’s ‘discovery stream,’ a capacity for 176 users, shade sails covering two thirds of water play area and zero depth water. The water will be heated too so you can splash around well into the cooler months! Find out more here. The free water play park was revamped in 2017 into a much needed green space which includes playgrounds, water play area, ping pong tables, outdoor bbqs and sheltered areas to sit. Find it at 36 - 40 Howard Avenue in Dee Why. Also on the northern beaches is the Collaroy Beach playground which has a small water play park! 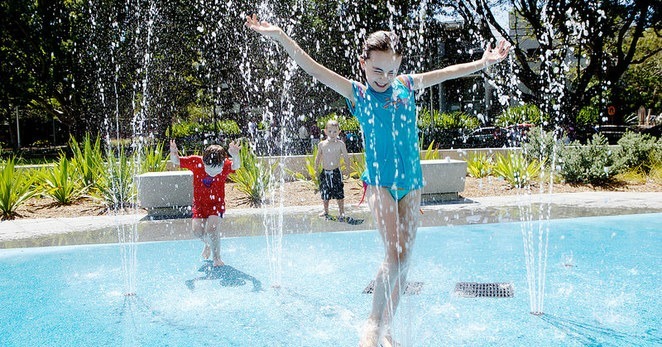 The 3rd waterpark to be opened by Parramatta Council, the Philip Ruddock waterpark went hand in hand with council’s ‘Cool Parramatta’ campaign- offering it’s residents a chance to get out of the sweltering summer sun. Water features are integrated into standard playground equipment for hours of cooling off with a laugh, with nearby BBQ and picnic shelters for the whole family to enjoy. When this park was upgraded, it received expansive lush green area for picnics and running around, two awesome age-appropriate playgrounds with lots of interweaving structures to climb- and a water play area! Jets shoot water skywards on blue spongy flooring- perfect for a splash around. This great playground has a hamster wheel, flying fox, a 5-way swing, climbing structures, a spinning ring, little cubby house with a slide..and of course, a water play area. It’s quite small, but gets the job done. It has a few pumps, and turnpikes that get released into a little mini dam of sorts that kids can direct the flow of by moving the rocks around. 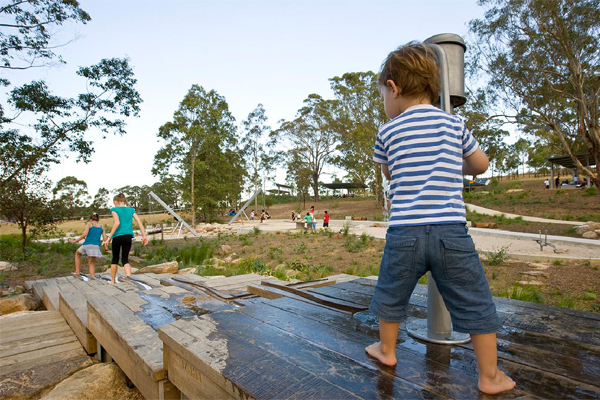 DID YOU KNOW: The Australian Institute of Landscape Architects voted this the number 1 playground in NSW and the ACT?! It truly is “nature’s wonderland” with a bushland feel that encourages nature play at its finest. It has all kinds of play equipment including a double flying fox, giant swings, climbing wall and slide, sand diggers and balancing beams- all made from recycled timbers and trees that died onsite. It’s water play area is small, but still worthy of a visit. The children’s Backyard to Bush precinct at Sydney’s favourite Zoo received some water play features- as if Taronga could get any better! Taronga Zoo said “Water splashes over a sandstone frog-sculpture into a pond lined with stainless steel yabbies, ducks and lily-pads, in which pumps will be installed next year so that children can control the water flow through the shallow water play area.” Kids can get barefoot and hop over stones embossed with dragonflies and make a big splash as water runs from pumps into troughs. Livvi’s Place playgrounds are always terrific, and this one’s still shiny and brand spanking new, too! This inclusive play space has a sandpit, trampolines, spongy flooring swings, a performance stage- and a large water play area with 6 water jets! Although it’s not free, we recommend a visit to the Macquarie Fields Leisure Centre that packs a real splash! It boasts a big, colourful and extravagant water splash park suitable for all ages, with slides with hoops to travel through, water buckets, jets, and plenty of H2O. Hi, Thank you ... Couple of additions .. There is a great park with a water play area (lots of fountains) at the park in Dee Why... Walter Gors Park ... 36 - 40 Howard Avenue, Dee Why NSW 2099 Also a small water play area in the great park at Collaroy Beach. No waterplay parks on the northside of the bridge except Taronga Zoo. It is very expensive to enter and kids sometimes just want to play in the water. Macquarie Fields Leisure Centre is great fun. There is an outdoor water play area for children and there is also a dry playground area for those that have had enough water. There is undercover tables and BBQ's. There is also 3 indoor pools of varying depth for a sun free environment and there is an outdoor pool for those that would prefer the open air. The staff are really nice too! Just what we need built in and around port augusta south australia because temperature gets so scorched here its not funny plus we need something here for the kids to keep them entertained. We've got nothing here. If only the mayor of port augusta would look at things like that for everyone. The water park at Macquarie fields pools is pretty good to! Hello Kiyara, here at ellaslist we're always on the look out for activities and venues around Sydney and surrounds, so if you have any suggestions please send them through to [email protected] Thanks! There should be some of these water parks in Wollongong. Well not just Wollongong all over nsw. Why just in Sydney? Have been to Blaxland Riverside Park a number of times. Great place for all ages. Has a small kiosk and bbq areas aswell. Open space to kick a ball around and explore. Everyone has a great time cooling off in the water adventure park. Steele Park is great. It small and has a shade sail covering it. Great for 2-3 year olds. Also a great playground next to it. Gets busy so parking can be hard and there is a great coffee shop just a little walk back towards Earlwood across the river.